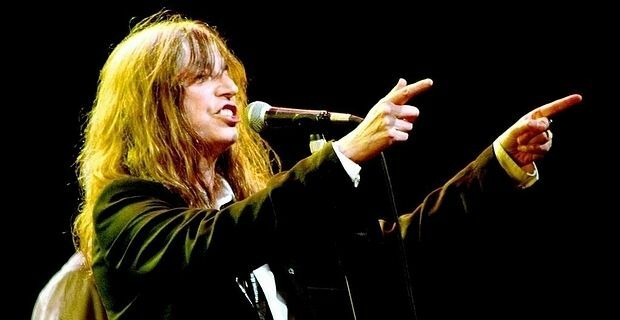 Punk veteran Patti Smith has spoken about her collaboration with Johnny Depp on the title track of her new album Banga. The Hollywood actor is an enthusiastic musician and Smith contacted him while he was filming The Rum Diary. Presumably the real Keith Richards was not available. Smith, not an artist you would normally associate with celebrity collaborations, sang the song down the phone-line to Depp and asked him for ideas. "Then Johnny said he would send it to me so I wouldn't forget," Smith told Spinner. "So I'm waiting and waiting and he didn't send it! I said, 'Johnny, where's Banga?' He said, 'Oh, you'll get it'. And I got it, he'd put drums, guitars, everything! So the first minute of the song is all me and Johnny Depp." Apart from Hollywood co-writers, the unusual album, her first collection of original material since 2004, also features a tribute to the late Amy Winehouse and a cover of Neil Young’s After The Gold Rush. "I was just sitting in a café having coffee and After the Gold Rush came on," she explained. "And I realised that the first two verses of After the Gold Rush said everything that I wanted to say. I didn't think I could say it any better." Isn’t it refreshing when an artist realises that their youthful inspiration is shot, and the best option is to rehash someone else’s work from four decades ago? Smith’s UK tour in support of Banga starts on June 25 in the rock n’ roll hotbed that is Wolverhampton Civic Hall.